Step up to the heavy-duty cleanup power of the MV lawn and litter vacuum. Designed for both hard surfaces and turf. 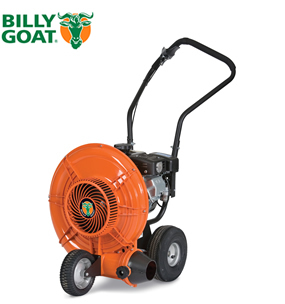 Billy Goat’s F601S Force blower features the next level of performance push blowers. Forget the fatigue associated with heavy metal machines. 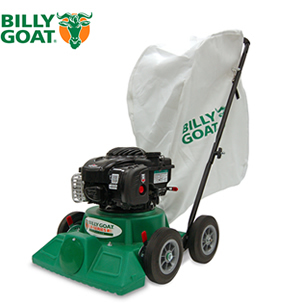 The Billy Goat LB352 vacuum with its 20" diameter nozzle is a favourite amongst gardeners and homeowners. Billy Goat has designed and manufactured property cleanup products with a reputation for innovation, productivity and quality. We invite you to review our website and work with our worldwide network of stocking and servicing dealers to pick the machine that is right for your clean up application, property and season. 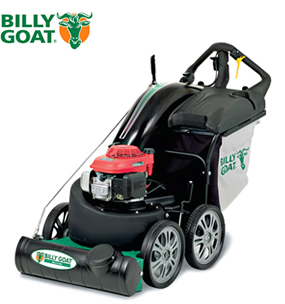 In spring, use Billy Goat’s de-thatchers, aerators, over seeders, sod cutters and chippers to knock out the annual “Spring Clean-Up” of thatch, leaves, blooms, branches, seeds and other lawn and garden debris that has accumulated over the winter.